Paradise Peak Halong Cruise will be launched from Nov 01st, 2011. 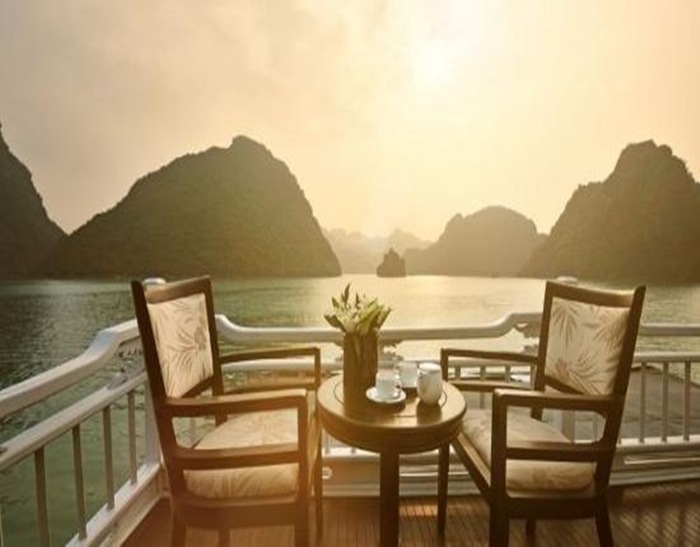 At that time, the luxury vessel will satisfy the most well-experienced travellers who enjoy the sunlight in Halong Bay. In all aspects, Paradise Peak Halong Bay Tour seems to mirror the splendour and majesty of the surrounding scenery offered by Halong Bay. Paradise Peak Halong Bay Cruise does not only offer a unique travelling experience, it allows you to dream with your eyes wide open... 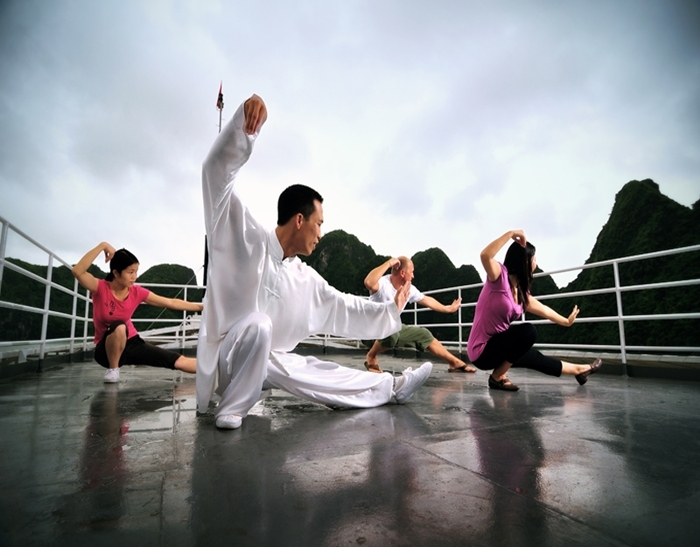 Experience a true paradise with the most luxurious cruise of all in Halong Bay: The Paradise Peak Halong Cruise. 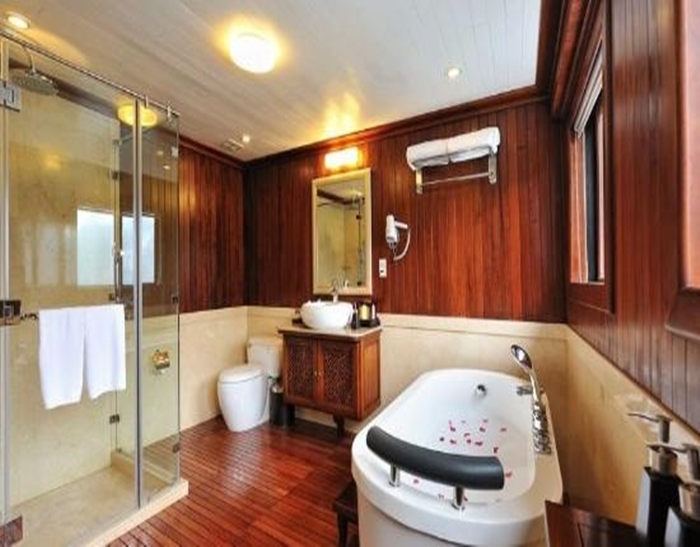 With 08 cabins of unrivaled degree of luxury, Halong Paradise Peak offers a trip to remember. 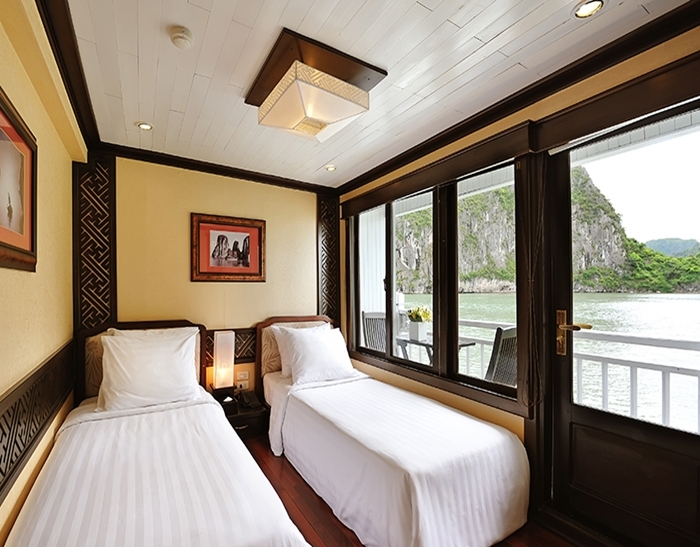 The Paradise Peak Halong Cruise allows you to live your dream in reality, with endless comfort and care. 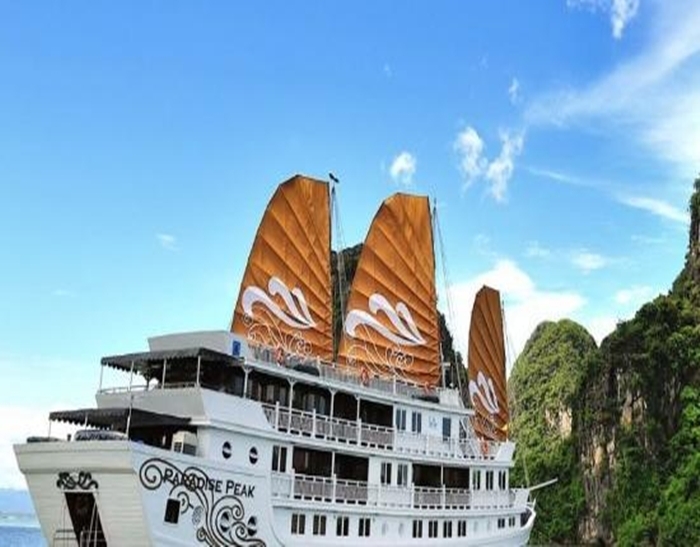 Similar to Halong Luxury vessel, Paradise Peak Halong Bay Cruise beautiful experience in the most breathtaking bay of Vietnam, only at a more luxurious scale that no other cruises can match. The three types of room: Junior Suite, Superior and Premium Suite promises the utmost comfort to your stay while on board. Other unique features of Paradise Peak Halong Bay Tour includes the most spacious and modern spa facilities on board and the only cruise to have library among all in Halong Bay. 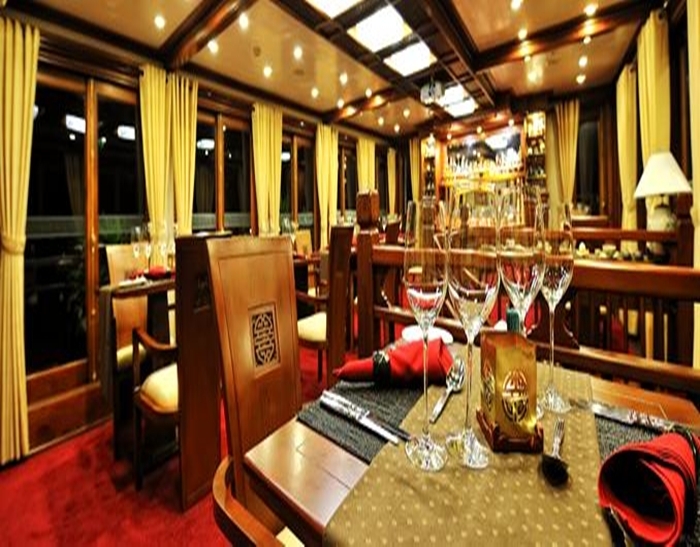 If you are a gourmet, Paradise Peak Halong Cruise will meet your satisfaction. The A-la-carte menu is designed to cater to a wide range of taste, blending the flavours of Vietnam and international fusion. An exquite collection of cocktails and beverages will further complete your meals. 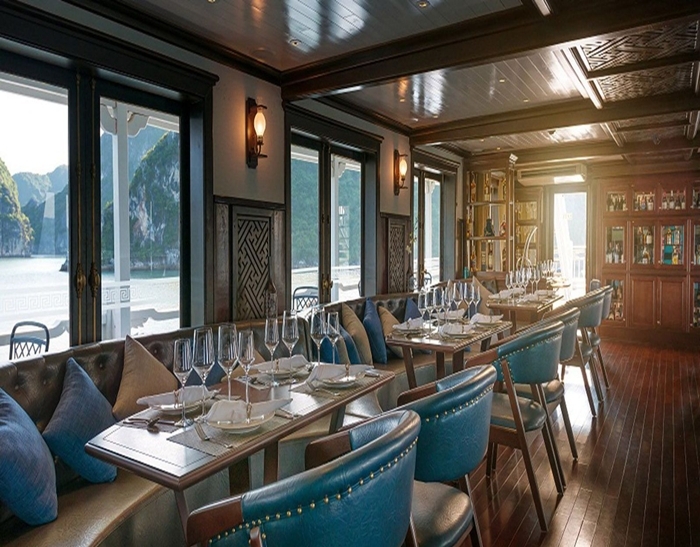 The restaurant with large windows on the third deck will give you birdeye view of the Halong Bay while a lavish BBQ dinner is waiting you on the sundeck. Experience a cruise trip like no others with the Paradise Peak Halong Cruise. 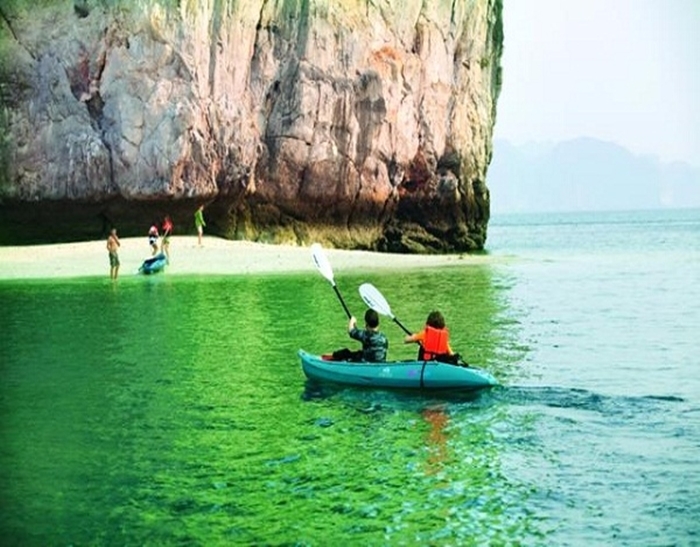 Book Halong Paradise Peak Cruise directly through Vietnam Eco Travel to get the best rates, big promotions and discover a different world with our luxury Halong Bay Cruises and Halong Bay Tour. Paradise Explorer as for safety reasons, we cannot take Paradise Peak directly to Cat Ba Island). Private day boat per cabin for 2nd day cruise in 3 days 2 nights program. - Select visit(s) and activities from the below menu*. the fishing floating village museum. Children from 5-12 will pay extra charge: $190-218/ 2 days 1 night itinerary; $333-388/ 3 days 2 nights itinerary (Low-High Season). An extra charge of USD 25.00 per extra bed if required to set up in the cabin for 02 days/1night program or USD 35.00 per extra bed for 03 days/2 nights program (already included in children rate). An extra charge of USD 10.00 per baby cot for 02 days/1 night program or USD 15.00 per baby cot for 03 days/ 2nights program if require. This extra service is subject to Paradise Cruises availability. 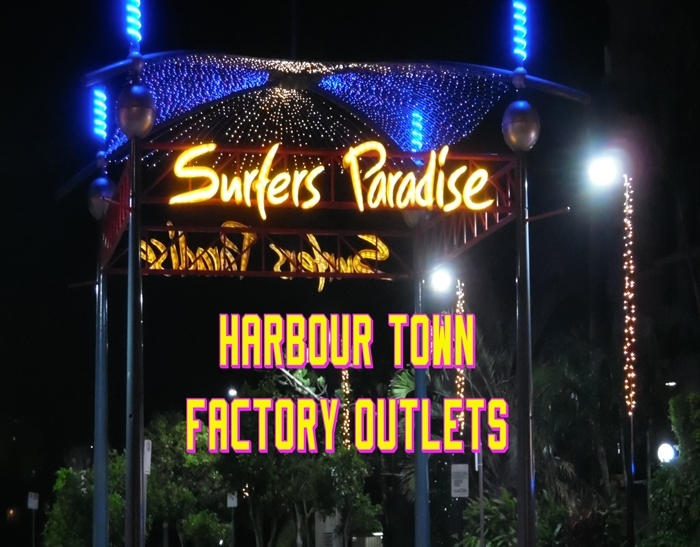 Paradise Cruises offer special quotation for last minutes bookings if the bookings are made in 72 hours, 48 hours or 24 hours before departure. Please contact us at: info@vietnamecotravel.com for further information. What do you think of Paradise Peak Halong Bay Cruise? Just arrived back in the UK after trip taking in Kuala Lumpa Vietnam & Singapore. Its difficult to select a single section of the trip however we had a fantastic time on the overnight cruise with Paradise Peak. On arrival we were greeted by Ronald & his team with Lily being introduced as our host & point of contact for anything during our time on the trip. Lily then took us to our accommodation which was a suite & of a incredibly high standard not just in visual looks but in all the facilities available. There were plenty of activities & short trips available however we wanted to chill out on our veranda taking in the magnificent views. 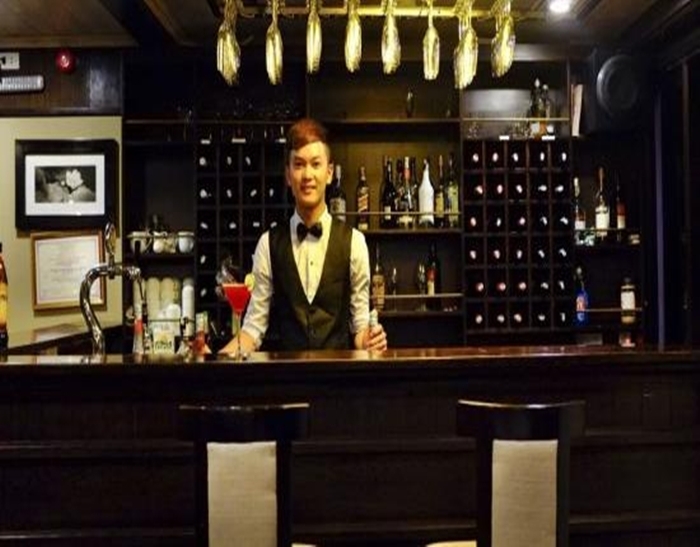 The evening entailed dressing in traditional Vietnamese costume (supplied by Lily) & a 3 course dinner which could be taken in the lounge with the other guests or in your room as you desired. We joined all the other guest where due to the small number of 8 suites was intimate & enjoyable as we were from different parts of the world - England Ireland Australia & the USA. I can fully recommend this 2 day night cruise which Ronald Lily & the team did everything possible to make the trip as enjoyable & memorable, they succeeded. "Amazing trip on the Paradise Peak!" We arrived to Halong Bay to beautiful weather and to fantastic service on Paradise Cruises. We were upgraded to a suite with full bath, jetted tub, breakfast area, and outdoor patio. Mr. Tung and Teddy were particularly great. 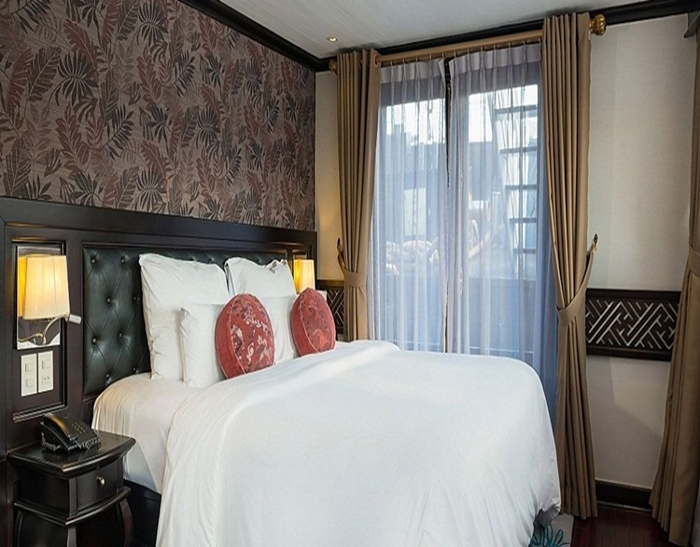 The room was beautiful, bed was incredibly comfortable and the service was impeccable. Could not have asked for a better experience, best boat on Halong Bay for sure!!! Thank you! "Amazing trip, lovely crew, great ship"
Our trip to Halong Bay was great! The airport transfer, the hotel pick- up were well organized. Unfortunately the weather wasn't that good, it was cold for November, but the friendly staff and the delicious food made still a perfect trip. The activities were interesting and good organized as well. The sauna after swimming was perfect. Hugely enjoyable cruise with a stop for some swimming/Kayaking and a visit to the caves. Staff were exceptionally attentive and the room (I was on the Paradise Peak) was amazing including Balcony/Jacuzzi. Ronald the Cruise manager was very helpful along with all the staff who were friendly and really do make the cruise special. Also the food/massage is very good! "Fantastic trip to Halong Bay!" Together with a friend I stayed at the Paradise Peak! We had two sunny days at Halong Bay, yeeh! The scenery is absolutly extrordinary! The boat, the rooms were beautiful and the staff was really great and nice! They provided us with interesting knowledge about Halong Bay! We had an amazing time and would definitely recommend people to book 1/2 night cruise on the Paradise Peak! Oh and you get so much food! Haha, great! We were on Paradise Peak, possibly the most luxurious cruise of Halong Bay. It is a full cruise similar with Paradise Luxury, just that it has 8 cabins and 16 passengers. My friends and I boarded it on 14-13 Dec, and were privileged to be onboard the Peak with just 8 of us! We went for a cruise+hotel combo, so we stayed a night in Hanoi (Elegance Diamond Hotel) and then proceeded to the cruise. Amazing hospitality right from the start - pick up at hotel, rest area (lounge) before boarding the cruise.. and warm towels and welcome drink when we got on board! The personal butler was just soo good, and food was ale-carte (buffet). The room was soo good, with a Jacuzzi attached. Many activities, from cave visiting to kayaking, every time we left the cruise and came back, we were welcomed with a warm towel and welcome drink. The view was spectacular, the hospitality was great, and the food was delicious. We even got to do squid fishing! Our package included a free lunch at their hotel, before a transfer back to Hanoi. Well, we disembarked from the cruise at 10.30am, and we had to wait till 11.30, before lunch was served. We then had to wait again till 12.30pm for the ferry back to Hanoi. I guess this could have been cut down.. too much waiting time. GREAT TRIP NONETHELESS!